COOPER: Welcome back. We’re here at the historic Old Seville Warehouse on South Main Street in Greenville, South Carolina. Republican Candidates taking questions from voters. The primaries are just three days away. Right now, please welcome Iowa Caucus winner, Senator Ted Cruz of Texas. TEXAS SENATOR TED CRUZ: Hello. COOPER: Welcome, how are you. Have a seat. COOPER: So obviously, you’ve won in Iowa. You’ve had a very good day today. There’s a new poll out saying that, “on the national race, you are actually now in the lead.” How does it feel out there for you? And then, we saw record shattering turnout show up. And you know what was so encouraging? The folks that came together, it was that old Reagan coalition. So we won among conservatives but we also won among evangelicals. We won among Reagan democrats and we won among young people. That’s the coalition it’s going to take I think to win the nomination but also to win the general election. And we needed up – our campaign earned more votes than any campaign in the history of the Iowa Republican Caucuses. It really was a testament to the grassroots. COOPER: You got a cease and desist letter today from Donald Trump. I don’t think I’ve ever heard of that actually happening in a race. One of many firsts that we’ve seen. What did you think when you actually got the letter? CRUZ: I’ll confess, I laughed. This has not been a typical race by any sense and I don’t think anyone is surprised that Donald is threatening to sue people. He’s done that most of his adult life. But this letter really was – look, I’ve practiced of 20 years and this letter really pressed the bounds of the frivolous and ridiculous letters I’ve ever seen. He was upset about an ad that we’re running on T.V. The ad talks about the vacancy of the Supreme Court and that we’ve got issues such as life, and marriage, and religious liberty, and the 2nd amendment that are in the ballots. COOPER: And it uses an old interview from Tim Russert back in the late 90’s? CRUZ: It plays Donald Trump doing an interview Time Russert where he explains in his own words, he says,” he’s very very pro-choice, he supports partial birth abortion -” and he says, “he’s pro-choice in every respect.” But most of the words in the ad are his own words on national television…CRUZ: … I’m doing an interview with Tim Russert where he explains in his own words, he says he’s very, very pro-choice, he support partial birth abortion, and he says he’s pro-choice in every respect. But, most of the words in the ad are his own words on national television, and his argument in the letter is running his own words, was defamation. CRUZ: … And, listen, I said this morning — held a press conference where I read his letter to everyone, and I invited Mr. Trump. I said, please, Donald. File this lawsuit. COOPER: You want to depose him? CRUZ: And, you know why? Well, that’s part of it, is that in any defamation case truth is a complete defense, and so his lawyer said he said that saying he’s pro-choice, which actually we don’t say he’s pro-choice. Donald says he’s pro-choice in every respect. COOPER: But, that was back in the late 1990’s. He’s, again, has said he’s evolved. Do you accept that he is pro-life? CRUZ: Well, let’s put it this way, four days ago on the debate stage, Donald Trump explained how many wonderful things he thought Planned Parenthood does. That was four days ago. Planned Parenthood is the largest abortionist in this country. They are responsible for taking the lives of millions of unborn children. I’ll tell you, nobody who is actually pro-life can stand up on national stage and sing the praises of planned parenthood as wonderful — I don’t think they do anything wonderful, and I don’t think we need to be sending federal taxpayer funds to an organization that on video has been implicated in what appears to be multiple federal felonies. CRUZ: … Well, look, as I laid out. So, his claim is if you tell people his record, if you actually show Donald Trump on national television his own words, that he’s going to file a lawsuit to prevent you from doing that. I pointed out, listen, we’ve got at least four pieces of evidence. Number one his own words on national television. Number two, what he said on the debate stage four days ago, singing the praises of Planned Parenthood. Number three, last year, not very long ago, when talking about Supreme Court nominees, Donald said his sister — now his sister is a Court of Appeals judge who was put on the Court of Appeals by Bill Clinton. He said his sister would make a phenomenal Supreme Court Justice. Now, listen, it’s great to support your sister, that’s a nice thing. But, if you’re actually suggesting someone for the Supreme Court, his sister is a radical pro-abortion judge. She struck down New Jersey’s ban on partial-birth abortion as irrational. That’s an extreme position. That’s who he suggested as a Supreme Court Justice last year. COOPER: … He has a lot of friends, he says. CRUZ: … Yeah, but it’s not friends, and he’s given — so, in 2006, for example, when the Democrats took over Congress Donald and his son gave about three times as much to the Democrats as they did to the Republicans. They helped fund putting Nancy Pelosi and Harry Reid as Speaker of the House and Majority Leader of the Senate. They helped set the stage for Obamacare. And, for anyone that actually cares for conservative judges, I’ll tell you, Anderson, there is no universe in which I could write a check to Chuck Schumer or Harry Reid, or Hillary Clinton, or John Kerry, or Joe Biden, or Jimmy Carter, and anyone who’s done that by definition does not care about conservative justices because the people he supported fought tooth and nail to put liberals on the Supreme Court. I think the stakes are too high for that. COOPER: … Should Apple be compelled to do that? CRUZ: I believe they should. They have a binding search order. And, listen, any time you’re dealing with issues of security, and civil liberties, you got to balance them both. And, I think we can walk and chew gum at the same time. We can protect yourself from terrorist, and also protect our civil rights. COOPER: Because Apple, for their part, they said this creates a backdoor that basically endangers all of our cell phones. CRUZ: Well, listen. I think Apple has a serious argument that they should not be forced to put a backdoor in every cell phone everyone has. That creates a real security exposure for hackers, cyber criminals to break into our cell phones. So, I think Apple has the right side on the global don’t make us do this to every iPhone on the market. But, I think law enforcement has the better argument. This concerns the phone of one of the San Bernardino hackers, and for law enforcement to get a judicial search order, that’s consistent with the Fourth Amendment. That’s how the bill of rights operates. To say, Apple, open this phone. Not Anderson’s phone…… law enforcement has the better argument. This concerns the phone of one of the San Bernardino hackers. And for law enforcement to get a judicial search order, that’s consistent with the Fourth Amendment. That how the Bill of Rights operates. To say, Apple, open this phone, not Anderson’s phone, not everyone’s here, open this phone. COOPER: But Apple says they can’t do that, that its new operating software that basically would be available on everybody’s phone. CRUZ: But they wouldn’t have to put it on everyone’s phone. And that’s — I believe that Apple, anyone, nobody has a right to defy a legal search warrant. And the way our process works, look, banks all the time keep financial records. And if you or I are a terrorist, if we’re a drug dealer, and a search warrant is served on your bank, they can get your financial records. That’s how the law enforcement system works. And the Bill of Rights prevents the government from seizing our information without any evidence, but when you have a criminal, when you have a terrorist, we know the San Bernardino terrorists were radical Islamic terrorists. If the Obama administration were not in this politically correct state of denial, ignoring that it is radical Islamic terrorism, we should have done more to prevent that attack. But after the fact, we ought to be doing every tool we can to ascertain who else they might be in contact with, if there’s a broader cell. So, of course, we should unlock their phones and find out who they’re talking to, what texts they’re sending, and that’s a basic matter keeping this country safe. COOPER: We just learned while we were on the air, President Obama plans to visit Cuba next month. I don’t know if you had heard that. But I’m wondering, as president, is that something you would do? CRUZ: It is not as long as the Castros are in power. And I will say I was saddened to hear that I wasn’t surprised. This was foreshadowed for a long time. And, you know, President Obama’s foreign policy has consistently alienated and abandoned our friends. There has never been an administration more hostile and antagonistic to Israel than the Obama administration. And what President Obama has shown to our enemies is weakness and appeasement. So his policy concerning Cuba and Iran both have parallels where he’s allowing billions of dollars to go to tyrants who hate America, who are state sponsors of terrorism, who are fighting against our nation. I think it’s a real mistake. I think the president ought to instead be pushing for a free Cuba. It’s 90 miles off the coast of America. And to go there and essentially act as an apologist — you know, it was really striking when the Cuban officials came to Washington with the opening of the embassy, a Cuban dissident came, and came to the press conference and wanted to ask a question. And the John Kerry State Department said, if she asked a question, she would be forcibly and physically removed. And I — you know, I remember being astonished, because said, look, I expected that treatment in Cuba. That’s what they do to free speech here. But the Obama State Department was happy to silence a dissident to protect the Cubans from even asking questions. I mean, listen, my dad was imprisoned and tortured in Cuba. He fought with Castro in the revolution and he was imprisoned and tortured by Bautista. And then my aunt, my Tia Sonia, was imprisoned and tortured by Castro. And so my family has seen firsthand the evil and the oppression in Cuba. And we need to have a president that stands up to our enemies, that doesn’t — you know, if you look at Cuba when the Soviet Union collapsed, they lost their major patron, their source of money. But then what happened is Venezuela stepped in and became a patron. And you saw the oil revenues and actually Cuba had a corrupt bargain where they would send thugs, they would send soldiers down to Venezuela, that they would use to oppress the citizens there and in exchange Venezuela would send money. Well, as oil prices have been tanking, Venezuela’s economy is in freefall. And suddenly Cuba was again on the ropes. The Castros were again on the ropes. And just like with Iran, the Obama administration steps in with a lifeline. And I’ll tell you one of the things, Anderson, I’m very concerned about, is that Obama is emptying Guantanamo. He is releasing terrorists that our soldiers bled and died to capture. And the next president is going to have to send soldiers out to capture them again or kill them when they return to waging jihad. And I fear that by the end of this year President Obama plans to give the Guantanamo Navy Base back to Cuba, which would be undermining U.S. national security interests profoundly. I hope he doesn’t do that. But it is consistent with his pattern of the last seven years. I think it is a profound risk. COOPER: If trials can’t be brought against the people in Guantanamo, what would you do with them, keep them there indefinitely? CRUZ: If they are terrorists who are waging jihad there, then they should be detained in Guantanamo. We could have military tribunals if need be. We can interrogate them. But the Bill of Rights does not apply to foreigners who are waging war against America. The Bill of Rights applies to Americans. And the people in Guantanamo, at this point, it’s down to the worst of the worst. You know, a really alarming percentage of the people released from Guantanamo return immediately to waging jihad, return immediately to going back trying to murder Americans. And part of the consequence of Obama is he engages in this…CRUZ: Among percentage of the people released from Guantanamo return immediately to waging jihad, return immediately to going back, trying to murder Americans. And part of the consequence of Obama is he engages in this — this politically correct denial where he and Hillary Clinton and Bernie Sanders and the whole Democratic Party, they won’t even say the words, radical Islamic terrorism. They don’t acknowledge what they’re fighting. And it’s part of the reason why we are so vulnerable, because we don’t have the a commander-in-chief that is fighting the enemy and defeating the enemy. COOPER: I want to bring in our audience questions. But before I do, probably the toughest question of the night, though, for you. Which side are you on, Clinton or South Carolina? CRUZ: On this, I am going to shamelessly waffle and say I love them both. COOPER: All right. Good answer. COOPER: I want you to meet Donna Gotscheld (ph). She’s the president of Upstate Republican Women. She says she is still undecided. DONNA GOTSCHELD: Welcome, Senator Cruz. GOTSCHELD: And as our governor would say, it’s a great day in South Carolina. GOTSCHELD: Senator, realizing that in a close husband and wife relationship, a wife has earned a great deal of respect from her husband and is thus a trusted adviser and confidante in everything except for special secret matters, and these issues, whether in America or abroad, what issues do you think your wife would be significantly interested in and possibly support their cause? CRUZ: Well, Donna, thank you for that question and thank you very much for your leadership. You know, I have been blessed in many regards, but in no way greater than — than marrying the love of my life, Heidi Cruz. She is an extraordinary woman. She is — she is the daughter of Christian missionaries. And so Heidi, as a little girl, lived in Africa. She lived in Kenya and Nigeria and her parents were missionaries there. Her brother is a missionary in Haiti right now. And she is — I met Heidi on January 2 of 2000. We were brought working on the George W. Bush campaign. And we started dating on January 5th, three days later. And it was love at first sight. I mean I was smitten by her hard. I mean she is beautiful, she’s brilliant, she’s an unbelievable businesswoman. But she’s also the most loving mom and wife. We are best friends in a very real sense. We’re on the phone two, three, four, five times a day. We call each other on everything. We cooperate on everything. She is out on the trail. I cannot tell you how many people, as I’ve traveled around, when I got elected to the Senate, said, listen, Ted, you’re fine, but we love Heidi, so we’re voting for you for Heidi. And I was like, well, I — I’m thrilled and I’ll take it. You know, she’s got a real heart for economic development. You know, when you’ve seen, as a little girl, poverty, poverty in Africa, when you’ve seen suffering — you know, Heidi and I traveled down to Nicaragua with a mission trip to drill a water well in an impoverished village. And when you’ve seen people that are really hurting, you understand that — that we need policies to lift people out of poverty. And I think Heidi has a real heart here in America for helping people lift out of the poverty by empowering them, empowering them to start small businesses. Empowering them to achieve the American dream. And, you know, an important part of that is also educational options and school choice. I think school choice is the civil rights issue of 21st century. I think every child in America deserves access to a quality education. And so Heidi and I, in this campaign, we are full and total partners. She is, right now, on the campaign trail. I’m on the campaign trail. My dad is on the campaign trail. Our little girls even sometimes are on the campaign trail. But — but I think — I think she will be involved in a lot of things if we win and — but I think she has a real passion where she’s going to focus a lot of energy is economic empowerment, helping people and especially women, especially Hispanics and African-Americans, those who are struggling, helping them achieve the American dream by understanding the principles of business, starting a business, expanding and achieving greater opportunity. GOTSCHELD: Thank you so much. COOPER: I don’t — I don’t want to — I don’t want to embarrass you at all, but your wife mentioned this to CNN a while back, that you occasionally, when you call her on the phone, you sing to her, you sing musicals? CRUZ: Um, well, embarrassingly enough, yes. And I am a painfully horrible singer. COOPER: What’s your favorite musical? CRUZ: I actually don’t sing musicals. CRUZ: I mean I will sing things like, uh, on my darling, oh my darling, oh my darling, Heidi time. CRUZ: Which is really corny, but — but, you know, I used to do it when she put it on speaker phone in her office and embarrass her or, you know, I’d kind of do, you know — you know, I just called to say I love you. I just called to say I care. I cannot sing to save my life, but — but, uh, but my wife seems to at least laugh at it. (SINGING) I just call to say, I love you. I just called to say I care. I cannot sing to save my life, but my wife seems to at least laugh at it. COOPER: Alright. I want you to meet Bobby Cox, he’s a former Army Ranger, he says he’s leaning toward Governor Bush, but he’s still undecided. Bobby? QUESTION: Evening sir. Thanks for coming out to Greenville here. By way of background, I attended Citadel down in South Carolina. Yeah, great school, and then during my senior year the actual 9/11 attacks occurred, and upon graduation I went into the Army. I actually deployed four times to Iraq. And, so during that time that we were in Iraq, we really felt like we were putting the Iraqi government on a stable ground. But, fast forward a couple years later when the actual cities that we had actually fought to protect with so much effort, time, and blood were actually retaken by ISIS. And, so there was a frustration there were a lot of my men thought that their time had been squandered overseas based upon really the lack of the U.S. political will to really see victory. So, I want to ask you, as a commander in chief, you know? If you take on that mantle of leadership, what would you do to ensure the service members and their families their sacrifices during the time of war are not wasted like we see in the past? CRUZ: Well, Bobby, let me say first of all, thank you for your service and sacrifice. Thank you for defending this nation. CRUZ: And, you’re question incredibly important. As I travel South Carolina I meet everyday, active-duty military. I meet, everyday, veterans who are so unhappy with the direction we’re going right now. For seven years we’ve had a commander in chief who doesn’t believe in the mission of the military. Who doesn’t stand by them, who has weakened and degraded the military in a way that this’ undermined readiness, and made us far less able to defend ourselves. Yesterday, here in South Carolina, I rolled out a comprehensive plan to rebuild the military. To restore the strength that we need to defend ourselves. And, you know, if you think about the last time our military was badly weakened, it was 1980. It was following the Jimmy Carter administration, another weak Democratic president who undermined the military. And, when Reagan came in, what Reagan did is he started with tax reform and regulatory reform. He lifted the burdens on small businesses. Than unchained the American free enterprise system. It produced incredible booming economic growth. That growth, in turn, that provided trillions in new federal revenue. Reagan invested that revenue in rebuilding the military. And, but doing so, bankrupted the Soviet Union and now the Cold War. We need a president in 2017 who does the exact same thing with regard to radical Islamic terrorism. That is what I intend to do — is start with tax reform, and regulatory reform. I will unleash the American economy, and use that economic growth to rebuild the military. So, for example, as you know, President Obama’s proposed reducing the regular Army to 450,000. I think that is far below what is needed to keep this country safe. I intend to increase it to a minimum of 525,000 soldiers. Likewise the Air Force. The Air Force has been reduced to about 4,000 planes. We need to increase that to a minimum of 6,000 planes so that we can project power, and use our air power superiority. The Navy. We’ve got 272 ships, the least we’ve had since 1917, literally a century ago was the last time we had a navy with this few ships. We need to increase that to a minimum of 350 ships. And, we need an overall force level of 1.4 million troops at a minimum. In addition to that, we need to dramatically expand missile defense as we see asymmetric threats, we see rogue nations, we need to be able to defend ourselves. We need to expand cyber defense. But, we also need to focus our foreign policy and military policy on identifying and defeating the real enemies. You know, I’ve got strong disagreements with the mistakes of the Obama-Clinton foreign policy the last seven years. One perfect example is Libya. Libya. President Obama and Hillary Clinton led the world in toppling the government in Libya, and sadly they were supported by more than a few establishment Republicans, including several who are running for President. That has proven to be a catastrophic mistake. Toppling the government in Libya meant we handed that country to radical Islamic terrorists. It’s now a chaotic war zone where ISIS and other radical Islamic terrorists pose an acute national security threat to this country. And, it led directly to failures of the Obama-Clinton foreign policy, led directly to the tragedy of Benghazi. Rather than engaging in trying to topple governments in the Middle East, and nation build, I think the focus of the military needs to be defending this country, protecting our national security interests. So, what should we be doing? Oh, and by the way, many of those same folks, Obama, Hillary, and those same Republicans, are now saying we should do the same thing in Syria. Topple Assad. CRUZ: … Oh, and by the way, many of those same folks, Obama, Hillary, and those same Republicans, are now saying we should do the same thing in Syria. Topple Assad. And, if we do that the same result is going to happen. If we topple Assad — Assad’s a bad man. But, if we topple Assad, ISIS will take over Syria. That is worse for America. Instead of getting in the middle of civil wars, we ought to be focusing on the enemies of America. We ought to be utterly destroying ISIS. We ought to be using overwhelming airpower, we ought to be arming the Kurds, we ought to be using the tools we have to utterly, and completely destroy them. And, I’ll say a couple of things also. When it comes to the men and women of the military, I don’t think the military should be governed by political correctness. Should be governed — should be used as for social experiments. So, for example, if I am elected president we will not be drafting our daughters into combat on the front lines. Look, I’m the father of two daughters. Women can do anything, but the idea that the federal government would forcibly conscript young women and put them into combat, that makes no sense at all. Another one of the most shameful things that, I think, of the last seven years is that we are sending our service men and women into combat with rules of engagement that have their arms tied behind their back. That have it impossible for them to fight and defend themselves and win, I think that is immoral, it is wrong, and I will tell you this. I give you my word as commander in chief, that will end on January 20th, 2017.
COOPER: Just a quick follow up. Donald Trump has said that George W. Bush didn’t keep this country safe because 9/11 happened on his watch. What’d you think when you heard that? CRUZ: I thought it was ridiculous. I thought it was really painful. Listen, I like Donald. I am not going to engage in personal attacks, but I think his policy positions have not made any sense. When he stood up and defended impeaching George W. Bush — that was his position. George W. Bush should have been impeached. Listen, I’m a constitutionalist. My entire adult life has been spent defending the Constitution, defending the Bill of Rights. The standard for impeachment is high crimes and misdemeanors. He had no argument that George Bush committed any high crimes and misdemeanors. He just said on the stage it was a mistake. You know, you don’t impeach people for things you say are a mistake. And, at the time that Donald Trump was promoting impeachment, look, that was the — those were the views of the Michael Moore’s of the extreme fever-swamp of the left. And, I have to say to see on a Republican presidential stage a candidate suggesting we should have impeached George W. Bush. I think that really draws into question the judgement of that candidate to be commander in chief. COOPER: I want you to meet Pastor Travis Haynes. He’s from the Redemption Church. He says he’s leaning in your favor, he says he also likes some of Donald Trump’s policies. Pastor’s, welcome. QUESTION: What will you do to help protect those values if you’re elected president? CRUZ: Well, Pastor, thank you for being here. Thank you for your ministry. You are right. We are seeing an assault on Judeo Christian values. We’re seeing an assault on religious liberty, and we need a president who will stand up unambiguously, and protect those values. You know, if you look at life, if you look at marriage, if you look at religious liberty, all three are intertwined, and you know, one of the dynamics you all have notice in a Republican primary is every republican candidate says they support life, marriage, religious liberty. That’s what you say when you’re running as a Republican candidate for president. My suggestion, Pastor, is don’t listen to what any of us say. Instead, follow the biblical test. You shall know them by their fruits. Ask of any candidate, don’t tell me you’re pro-life. Tell me what you’ve done to defend the right to life. So, for example, before I was in the Senate I was the Solicitor General of Texas, the chief lawyer for the state in front of the U.S. Supreme Court. We brought together a coalition of states before the U.S. Supreme Court defending the federal ban on partial birth abortion, and we won 5-4. We brought together another coalition of states defending New Hampshire’s (INAUDIBLE) law. And, we won unanimously. CRUZ: And in Texas when the state legislature passed a law banning taxpayer funding going to Planned Parenthood, a federal district court struck down that law. And I personally argued the appeal in the Court of Appeals. We won unanimously reinstating that law and defunding Planned Parenthood. So on the question of life, a record matters. Likewise on marriage. You know, in June of last year, we saw a decision from the Supreme Court. It was nothing short of tragic. Now, several of the Republican candidates when that decision came down put out statements that essentially said, “It is the settled law of the land, we must accept it, surrender, and move on.” Those are almost word for word the talking points of Barack Obama. I think there’s something really wrong when Republican candidates are echoing the talking points of Barack Obama. I’ll tell you, my view is very different. I think that decision was fundamentally illegitimate, it was lawless, it was completely inconsistent with the Constitution, and it will not stand. And then on religious liberty. Religious liberty for me has been a lifelong passion. I have spent the last two decades of my life fighting to defend religious liberty. When I was solicitor general of Texas, we defended the Ten Commandments monument that stands on the state capitol grounds. We went to the U.S. Supreme Court, and we won 35-4 upholding the Ten Commandments. We defended the Pledge of Allegiance, the words “one nation under God.” We went to the U.S. Supreme Court; we won unanimously. And then in private practice, one of the cases I’m most proud of, is I represented over 3 million veterans pro bono, for free, defending the Mojave Desert Veterans Memorial. This is a loan white Latin cross. It was erected over 70 years ago to honor the men and women that gave their lives in World War I. The ACLU sued, arguing could you not display a cross on public land. They won in the district court, they won in the Court of Appeals. The court ordered a giant sack to be placed over the Veterans Memorial with a change and a padlock at the bottom. And I represented 3 million veterans before the U.S. Supreme Court, defending the Mojave Desert Veterans Memorial. And we won 5-4. This for me is a life passion. And one of the things we’ve done — the media often belittles threats to religious liberty. They say they don’t exist, they’re not real. So we’ve hosted big religious liberty rallies. One in Iowa, one here in South Carolina at Bob Jones University where we brought in heroes, ordinary people. A florist, a baker, a T-shirt salesman, a soldier, a fireman to tell their stories. How they stood for faith and they were persecuted. I would commend you (ph), Pastor, and anyone else who wants to see them. If you go to our web site, it’s TedCruz.org, you can watch these stories, and they will uplift you. They will inspire you. How people made a decision: do I honor my faith, or do I give in to the government and be persecuted? And they chose to honor their faith instead. And so when it comes to religious liberty, if I’m elected president, I intend on the first day in office to instruct the U.S. Department of Justice and the IRS and every other federal agency that the persecution of religious liberty ends today. COOPER: I want you to meet — this is Dr. Amir Agob (ph). He works nearby in Anderson, South Carolina. He says he’s an independent. He’s going to vote in the Republican primary on Saturday, but he’s still undecided. Doctor? DR. AMIR AGOB, PRACTICING DOCTOR FROM ANDERSON, S.C.: Good evening, Senator. AGOB: You know, the the oil market is in big mess. AGOB: I would like to know your opinion on Saudi Arabia’s relationship with U.S. as the oil pricing is going down, and OPEC has done nothing to stabilize the oil prices. And that is affecting the economy. Recently Russia, Venezuela (ph), Qatar and Saudi Arabia reached an agreement to freeze the oil production instead of reducing it. So let’s assume for a minute that you are the president of United States. Would you continue your alliance with Saudi Arabia? CRUZ: Well, listen, our relationship with Saudi Arabia is, as you know, fraught with complications. They have been allies at times, but at times, the kingdom has been funding radical Islamic terrorism. They have been paying off the wolves in hopes that they will devour others rather that than devour the monarchy. And I think we need to hold our friends to account, that friends do not fund jihadists that are seeking to murder us. And when it comes to Saudi Arabia, we need to have real scrutiny and real pressure. Now, I’ll tell when you I have traveled aboard and met with heads of state and foreign ministers and defense ministers, over and over again what they say right now is it’s hard to be friends with America. They say, where is America? America doesn’t stand by their friends. That needs to change. Now, with respect to Saudi Arabia, Saudi Arabia is part of OPEC. It’s a cartel. They are not seeking our interests, they are seeking their monetary interests. I think what we ought to be doing when it comes to energy is two things. Number one, a significant part of the reason that oil prices and –part of OPEC. It’s a cartel. They are not seeking our interests; they’re seeking their monetary interests. I think what we ought to be doing when it comes to energy is two things — No. 1, a significant part of the reason that oil prices and commodity prices have fluctuated like crazy is the Federal Reserve has fluctuated from a strong dollar to a weak dollar, and every time that happens, going up and down and up and down, it ends up sending commodity prices soaring and plummeting and soaring and plummeting. And in my view we need to No. 1., audio the Federal Reserve and No. 2, move to a rules-based monetary policy, ideally tied to gold, because when it comes to the dollar we don’t want a weak dollar; we don’t want a strong dollar. We want a stable dollar. A dollar is a unit of measurement, and we want a dollar to be the same today, tomorrow and the next day, because that’s what all of the other economic decisions are based upon, and so I think a significant part of the volatility in the oil market is driven by the fluctuations in the dollar. Beyond that, when it comes to energy, you know, in the Senate, I’ve introduced legislation called the American Energy Renaissance Act. It is the most comprehensive energy legislation that has been submitted in the U.S. Senate. It would unleash the American energy resources. This country is blessed with abundant natural resources. And my view on energy is we ought to produce all of the above. It ought to be oil, and gas and coal, and wind, and solar, and nuclear, and ethanol, and biofuels and everything. But you shouldn’t have government picking winners and losers. There should be no subsidies. There should be no favoritism. It should be a fair and level playing field for everyone, so I intend to remove the barriers from Washington, which in turn will allow the American energy market to expand, to create high-paying jobs and to jump start the American economy. COOPER: Thank you very much for your question. QUESTION: This is Julie Herhsey. She’s president of a local nonprofit. She said she’s committed to voting for you on this Saturday, so you already have her vote, so don’t blow it — don’t blow it here. QUESTION: I don’t think he can. QUESTION: Senator Cruz, thank you for taking my question. QUESTION: In order to prevent future controversy and possible litigation, will you please justify constitutionally your legal right to be president of the United States as it relates to your natural-born status? CRUZ: Sure, I’m happy to, Julie. Thank you for that question. The law under the Constitution and federal law has been clear since the very first days of the Republican. The child of a U.S. citizen born abroad is a natural-born citizen. What the Constitution requires is for anyone to be president they have to be a natural-born citizen. So if you or I travel abroad and we have a child overseas, that child is a U.S. citizens by virtue of birth. That’s true if U.S. service members are travelling abroad. If they’re defending this country. You know, Bobby mentioned before he had a couple deployments. If he had a child overseas that child is a natural-born citizen by virtue of the child’s parents. Likewise if American missionaries are travelling overseas their children are natural born citizens. That’s why John McCain was a natural-born citizen. Even though he was born in Panama, because his parents were U.S. citizens. That’s why George Romney, Mitt Romney’s dad, was a natural-born citizen, even though he was born in Mexico when his parents were Mormon missionaries. And so the law is straightforward. Indeed the very first Congress, which was — consisted of many of the framers of the Constitution, the authors of the Constitution, wrote the very first laws on citizenship, and they explicitly defined the child of a U.S. citizen born abroad as a natural-born citizen. Now my mother was born in Wilmington, Delaware. She is a natural-born citizen. I was born in Canada, as you have heard by now. QUESTION: Yes, I’ve heard that. CRUZ: But I was a citizen by birth, by virtue of my mother’s citizenship, so I’ve never been naturalized. I’ve never breathed a breath of air on this planet when I was not a U.S. citizen. It was the act of being born that made me a U.S. citizen. So under the law, the question is clear. there will still be some that high to work political mischief on it, but as a legal matter, this is clear and straightforward. COOPER: There are — just to follow up — some legal scholars who say Donald Trump would have standing to bring a lawsuit. Is that something you would welcome just to put it to bed once and for all? CRUZ: You know, look, you can never write off the possibility of Donald Trump suing you. CRUZ: He is welcome to file whatever lawsuit he likes. That lawsuit would not succeed. It is not a meritorious lawsuit. If he wants to file a lawsuit, he can file it and lose. But the legal merits of the matter are clear. COOPER: We’re going to take a short break. We’re going to have more questions for Senator Cruz when we come back. More questions from the voters. We’ll be right back. COOPER: And welcome back. We are here once again with Senator Ted Cruz. Just a couple of quick questions before we go back to our audience. You’re on a Senate Judiciary Committee. If President Obama sends up a nominee, should they get a hearing to replace Justice Scalia? CRUZ: They should not. For 80 years it has been the practice that the Senate has not confirmed any nomination made during an election year. And we shouldn’t make an exception now. COOPER: Should they get a hearing though? CRUZ: I don’t think they should because it’s not about the particular nominee. I think that hearing would end up very politicized. And I don’t think it would be fair to the nominee. I think this is a matter of policy, that during a lame duck period we should not be confirming a Supreme Court nomination, particularly, you know, you look at Justice Scalia’s passing. Justice Scalia was a lion of the law. He was someone I knew for 20 years. He was brilliant. He was principled. He singlehandedly changed the course of American law. I’ve said before, like Ronald Reagan was to the presidency, so Justice Scalia was to the Supreme Court. And his passing leaves a huge void on that court. And this court — this nomination has the potential to dramatically shift the balance of power of the court. And so I believe we should have — we have an election coming up in November. huge void on that court. And this court, this nomination, has the potential to dramatically shift the balance of power of the court, and so I believe we should have — we have an election coming up in November. I think 2016 should be a referendum on the Supreme Court. And, you know, it was striking, the last Republican debate occurred the same day that we learned Justice Scalia passed, and I think that shifted. It really made people focus on the gravity of the stakes here. You know, you mentioned before the new poll today that has us in first place nationwide. It’s the first time Donald Trump has not been in first place in many, many months. And, I think this is an important reason why, that people were looking at that stage and saying who do I know beyond a shadow of a doubt would nominate and fight to confirm principled conservative jurists who would defend the constitution? You know, I mention before an answer to the pastor’s question. The cases that I’ve litigated defending religious liberty, defending life, almost all of those were 5-4. We are one liberal justice away from the Supreme Court striking down every restriction on abortion that’s been put in place the last 40 years. We are one liberal justice away from the Supreme Court writing the Second Amendment out of the Constitution. We are one liberal justice away from the Supreme Court ordering Tend Commandments monuments to be torn down, ordering veterans memorials to be torn down, and undermining our fundamental religious liberty. And, I think one of the most important questions in this election is who understands and is prepared and committed to fight for principled Supreme Court justices who will follow the constitution. And, I got to tell you, Anderson, I cannot wait to stand on that debate stage with Hillary Clinton and Bernie Sanders and take it to the American people. Their vision of the Supreme Court and the Constitution is a Supreme Court that mandates unlimited abortion on demand, that takes away our Second Amendment right to keep and bear arms, that takes away our religious liberty. I don’t think that’s what the American people believe in. But, we ought to take it to the election, and if the Democrats want to nominate a liberal they need to win the election. I don’t believe they’re going to do it. And, one of the reasons conservatives, I think, are uniting behind my campaign is they’re coming to the conclusion that I have the experience, the background, and the commitment to the constitution to make that case against Hillary Clinton and Bernie Sanders, and then to follow through and put principled jurists on the court. COOPER: Donald Trump, Marco Rubio, both have said that you’ve lied, that you’re a liar. Are they lying about this? CRUZ: (LAUGHING) You know, I got to say, Anderson, this is a strange election season. In many ways, both Donald Trump and Marco Rubio are following this pattern that whenever anyone points to their actual record, to what they’ve said, to what they’ve voted on, to what they’ve done, they start screaming liar, liar, liar. I mean, it is the oddest thing. I can’t think of any precedent in any previous Republican presidential election. Now, from my end, I have not and will not respond in kind. If they want to engage in personal insults, if they want to go to the mud, I’m not going to say the same thing about them. I think the people of South Carolina deserve more than people just throwing mud at each other. But, you know, look — let’s take for example the debate on Saturday. So, I mentioned on Saturday on the debate stage that Donald Trump for 60 years of his life has described himself as very pro-choice, as supporting partial birth abortion, as, quote, “Pro-Choice in every respect”. And, I mentioned that even now Donald Trump supports taxpayer funding for Planned Parenthood. And, his response was to bellow, liar, liar. And, he said, when did I ever say that? And, I responded, I said, well, when we were debating defunding Planned Parenthood I was leading that fight. You opposed me, and you said on national television you think Planned Parenthood does wonderful things. And then, Anderson, Donald proceeded to say on the debate stage once again, he thinks Planned Parenthood does wonderful things. The very thing he called me a liar for he agreed with on the stage. You know, a few minutes later we had an exchange with Marco Rubio — and listen, I like Marco. He’s charming, he’s a friend of mine, he’s very, very talented. But, what I said, and my focus is on record, and substance, and issues, and vision for this country. I think that’s what the voters are interested in. But, I made three statements about Marco’s immigration record in the debate. I said, number one, Marco right now supports granting citizenship to the 12 million people who are here illegally. Now, that is a fact. He said that on the debate stage two or three debates ago. In fact, on Meet the Press with Chuck Todd just a few weeks ago Marco said we should grant citizenship to people here illegally even if they have criminal convictions. He said that on national television looking into the t.v. camera. The second thing I said is I said when he was in Florida, he supported in-state tuition for illegal immigrants. That’s a fact. That is his legislative record. And the third thing I said is I said that he went on Univision and in Spanish said that he would not rescind the president’s illegal executive amnesty on his first day in office. If I am elected president, the first day in office, I intend to rescind every single illegal and unconstitutional executive action. Now, in response to that, Marco followed the same strategy as Donald, he just screamed liar, liar, liar. He didn’t actually dispute any of the substance. You remember what he said at the same time was, well, how would you know what I said on Univision? You don’t speak Spanish. Well, Marco was incorrect on that. But, look, truth matters. Every one of these issues, Donald and Marco are on video on national television stating their positions. And just yelling liar doesn’t make it so. And I would note, by the way, if Marco is right that I’m lying, then I’ll tell you else has to be lying, Jeff Sessions has to be lying, Mike Lee has to be lying, Mark Levin has to be lying, Rush Limbaugh has to be lying, Phyllis Schlafly has to be lying, James Dobson has to be lying, because every one of them has said the exact same thing I did, most of those folks haven’t endorsed me. They’re not supporting me, but they’ve spoken the truth. And it cannot be — look, one of the things I love about the people of South Carolina is how seriously they take their responsibility to vet the candidates. So you can go — you can go to our Web site, watch the video and see Marco and Donald stating their positions. And I’m going to continue focusing on issues and record, and just yelling insults and liar is not a response when you want to run away from your record. COOPER: Let’s get more questions from voters. This is Robert Tucker. He’s a lawyer. He says he’s still deciding between you and Senator Rubio. ROBERT TUCKER, LAWYER: Hello. Welcome back to Greenville. TUCKER: From time to time we see articles written in the paper or on television that you don’t get along with some of the Republican senators, your colleagues in Washington. If you’re going to have a problem with them, what are you going to say to them as president to get them on board so that we can get legislation passed? CRUZ: It’s a great question, Robert, thank you for asking it. Let me focus on two levels. Let me, number one, explain why that is, and then, number two, how we actually change the direction in Washington. The reason why that is, is simple. It’s not that I speak with a lack of civility or respect. I mean, you’ve seen in this presidential campaign, as other people insult me, impugn my integrity, I don’t respond in kind. I try very much — you know, the Bible talks about if someone treats you unkindly, repay them with kindness. It’s like heaping coals on top of their head. That has been the standard I’ve tried to follow. That’s how I’ve approached it in the Senate. So I have not attacked or insulted my colleagues in the Senate, Democrat or Republican. Even if I disagree with them on the issues, I’ll tell you why they say Ted is unlikable in Washington. Because I’m actually honoring the commitments that I made to the men and women who elected me. So, for example, on Planned Parenthood, I led the fight for to use the budgetary power of Congress to stop giving $500 million to Planned Parenthood. What Republican leadership wanted to do is have a show vote, lose the show vote, and then fund all of Obama’s agenda, including Planned Parenthood. So what’s unlikable is when you stand up and say, how about we do what we said we would do? Likewise, when I stood up and led the fight against Obamacare, they said that was unlikable. When I stood up and led the fight against the Rubio-Schumer amnesty bill, they said that was unlikable. You know why? Because all the money in Washington, all the lobbyists in Washington wanted amnesty. If you look at K Street, if you at the special interests, if you look at Wall Street, amnesty they think is great. It’s cheap labor. And so when you actually stand up — and by the way, the way we won these fights is that I stood up and tried to shine a light on them, shine attention on them and empower the American people. So, for example, amnesty, Rubio-Schumer amnesty passed the Senate. Every Democrat voted for it. And a whole bunch of establishment Republicans. And it was headed to the House to pass. House leadership, John Boehner, intended to take it up, pass it with all the Democrats and a handful of Republicans, roll over about 200 House Republicans. And I stood with Jeff Sessions and Steve King and we took the case to the American people. And what happened is millions of American people rose up, lit up the phones to Congress and said, don’t do this. And we defeated the Rubio-Schumer amnesty bill in the House. The opening chapter is entitled “Mendacity.” It describes the inside story of what happened on the debt ceiling, where Republican leadership wanted to make it easier for Harry Reid to add trillions in debt to our country, and I objected to that. And, the act of objecting, of honoring the promise I made to the men and women who elected me engendered more animosity and unhappiness than anything I’ve done in my time in the Senate. You know, just this morning, Senator Jim DeMint, tremendously respected former Senator here from South Carolina, was on a radio interview. He addressed this question, he said, listen. Ted is friend. Anyone who says he’s unlikeable is being ridiculous. They said the same thing about me, Jim DeMint said, because Jim DeMint honored the commitments he made to the men and women of South Carolina, and Republican leadership hated Jim DeMint because, not that he spoke mean about them, but because he actually said let’s do what we said we would do. So, let’s take the second half of your question. How do we fix the problems? Because we actually need to fix them, not just talk about them, we need to change the direction of this country. A president has really three levers, the presidential authority to change the direction of this country. Number one is executive power, that’s been the one that Obama has abused so much. Now, the silver lining is everything done with executive power can be undone with executive power. That’s why I pledged on day one to rescind every single illegal and unconstitutional executive action taken by Obama. It’s why I’ve pledged to instruct the Department of Justice to open an investigation into Planned Parenthood, and prosecute any and all criminal violations. It’s why I’ve pledged to end persecution of religious liberty in the executive branch. It’s also why I’ve pledged to instruct the Department of Education on day one that Common Core ends today. Using legitimate executive power you can end many of the abuses of Obama if you just have a president willing to use that power. The second avenue of executive power to change the direction of this country is foreign policy. It’s why I’ve pledged on day one to rip to shreds this catastrophic Iranian nuclear deal. And, on day one, to begin the process of moving the American embassy in Israel to Jerusalem. Both of those are foreign policy the president can do immediately. And it’s worth remembering that this same nation, Iran, released our hostages the day that Ronald Reagan was sworn in. And, then the third avenue to change the direction of the country is legislation. Legislation is not easy with this broken Congress. I’m running on two big legislative initiatives. Number one repealing every word of Obamacare. And, number two, adopting a simple flat tax and abolishing the IRS. Now, neither one of those are easy. I’m not remotely naive, or pollyannish. Could I get those done in this Congress? No. But, think about the last time we beat the Washington cartel. It was 1980, it was the Reagan revolution. Remember, Reagan in 1976, primaried Gerald Ford. You want to make Republican leadership loathe you, come within an inch of beating the incumbent Republican president in a primary. You think they dislike me? They hated Reagan with the heat of a thousand white hot suns. He was unlikeable. And, yet, what did Reagan do? In 1977, 1978, 1979, he didn’t fly to Washington, sit down with the old bulls and say, come on guys, let’s stand for something. He know that wouldn’t work. Instead, he took the case to the people, he built a grassroots army. The Reagan revolution swept in. And, when you go to the people it transformed the incentives. Today, everyone’s a Reagan Republican. You cannot find a Republican who will not swear that Ronald Reagan is tattooed somewhere on their body. But, the reason is he took the case to the people, and he changed the incentives. How do we abolish Obamacare, repeal Obamacare, and adopt a flat tax? We make the election a referendum so we come out of November 2016 with the mandate from the people. And, that’s exactly what I intend to do. COOPER: Thank you for your question. COOPER: Senator, this is Susan Harvey, she’s a local travel agent. She says she’s still undecided. Susan? QUESTION: Hi. If you’re elected, what position in your cabinet would be the most important to fill first, and why? CRUZ: That is a very good question. I would say it would be a three way tie between Secretary of State, Secretary of Defense, and Attorney General. And, I think all three are critically important. Listen, State and Defense — when it comes to defense we need to start rebuilding our military immediately. When it comes to State, we have abandoned our friends and allies nationally and we need to — it’s part of the reason I mentioned before. Ripping to shred the Iranian nuclear deal, and moving the American embassy to Jerusalem. Both of those are within the power of the president, but they’re also powerfully symbolic. You know, moving the embassy to Israel tells Israel, it tells all of our allies, it tells our enemies, America is back. You know, Obama in his opening weeks, he sent back the bust of Winston Churchill to the United Kingdom. If I’m elected president, Winston Churchill is coming back to the Oval Office. So as secretary of state we need someone strong, someone who defends this country, someone who represents this country. Look, I’m not in the position right now to be naming cabinet appointments, but I’ll tell you, a secretary of state in a Cruz administration would be someone like John Bolton, would be someone who is strong, who defends this country, who stands our by our allies and stand up to our enemies. And then looking at attorney general, attorney general, the lawlessness of he Obama administration has been one of the saddest legacies. And you know one of the most revealing aspects — I mean, Anderson, if you watch reporters in Washington, off the record, you get them at the bar having a couple drinks, and you say, is Hillary Going to be indicted? Inevitably the answer they give you is they say, well, it depends on if the Obama White House decides they want to throw her overboard. It they decide politically they want to keep her, then no, she won’t be indicted, and if they decide they’re done with her, she will. Now how sad is it that the media accepts as a given that whether someone is prosecuted under the criminal laws depends on what some political hack in the West Wing thinks. You know, I used to be an associate deputy attorney general at the U.S. Department of Justice and I spent five-and-a-half years as solicitor general in the state of Texas. Law enforcement and the administration of law is critically important. And I give you my word that the attorney general in my administration will be blind to party or ideology. It will not be a partisan position. Instead the only fidelity of the Department of Justice will to the laws and the Constitution of the United States. That’s the way it’s meant to work. COOPER: Senator, we just got a few minutes left. Do you want to tell me what reporters you’re having drinks with in D.C.? ANDERSON: What’s your favorite cocktail? CRUZ: I’m a scotch fan. I understand you’re also kind of a night owl. What do you do late at night. What do you — do you watch television? Do you have a guilty pleasure? Are you reading something now? CRUZ: Look, back when I wasn’t running for president I would watch TV. I used to remember what that was like. I’m a huge movie buff. I love movies. I like video games. One of the things — if you asked my wife, if you asked Heidi what drives her crazy about me the most, it is my iPhone. If she could fling my iPhone out the window and into the trash, she would be thrilled, because I’m on my iPhone. I’m playing Plants versus Zombies or Candy Crush. My girls love it. I mean, we’ll sit there, the three of us, playing the iPhone and Heidi wants to, like, throw something at all three of us. ANDERSON: What — I know you’ve done a lot of impersonations on the campaign trail. I’ve seen some of them, “Simpsons” characters, “Princess Bride.” What’s your favorite one? And do you want to grace us with it? CRUZ: Oh look, I mean, part it have is you’ve got to have fun. You know, a lot of times I get the questions in town halls — how do Republicans reach young people? And in answer to that, part of it is substance. We’ve got to make the case that the Obama economic agenda is hammering young people. For seven years young people come out of school with economic stagnation They can’t get a job. They don’t have a future. Obamacare is a massive wealth transfer from young, healthy people to everybody else. And the national debt is hammering young people. But part of getting young people is having fun, loosening up. You know, would it kill the Republicans to crack a joke? Actually some of them I think it might. So, look, I’ll give an example — it’s — impersonations is part of that. It’s just sort of having fun. But you know, I’m reminded of a few years back I was out in L.A., traveling out there. And the week before I arrived these posters began appearing all over town. And they’re posters of my head on a shirtless torso that is ripped. And it’s covered with tattoos, a giant eagle on my chest, two six shooters on my abs, which are a perfect eight-pack. CRUZ: Winston — you sound less than convinced. ANDERSON: Senator Cruz, thank you very much. ANDERSON: That’s all the time we have. I want to thank Senator Cruz, and Rubio and Dr. Carson. A special thanks to all the voters being here for asking the questions, and the viewers at home. I hope you join us tomorrow for the rest of the candidates. I want to thank everybody in Greenville. Tomorrow night, same time, different city, another town hall. 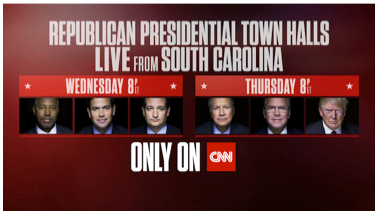 Columbia, South Carolina — Jeb Bush, Donald Trump, John Kasich right here on CNN. Our coverage continues with Don Lemon right after this.